Virginia Bird, Managing Director of Sabu Sabu Natural Body Care, celebrated her birthday at her home in Mae Rim on Friday June 8, 2012. The evening saw traditional Lanna performances from students of the College of Dramatic Arts and music by Aussie John and his band. On May 25, 2012 Furama Hotels International (FHI) led by Mr. Jason Peck, CEO-FHI, organized the first annual Furama Futsal Cup 2012 (Asia Pacific Tournament) at Sky Kick Arena Bangna, Thailand for their staff to meet, compete, and form relationships among all the Asia Pacific area Furama hotels in Singapore, Malaysia, Thailand Indonesia. 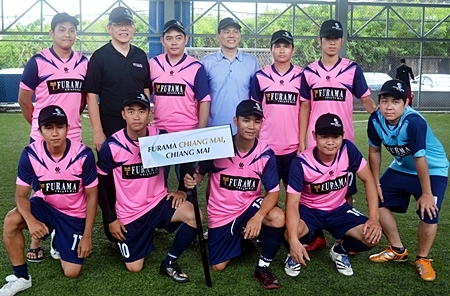 Furama Chiang Mai took the winning trophy at the competition. Bangkok teams FuramaXclusive Asoke, FuramaXclusive Sukhumvit and FX Hotel Makkasan were first runners up. The event was also sponsored by CP – Meiji CO., Ltd., Unilever Food Solutions Thailand Co., Ltd., Food Mixes Group Co., Ltd., and Ete Co., Ltd. The Siripanna Villa Resort and Spa held a reception at the Gallery followed by a fabulous Wine Dinner featuring Silver Oak Wines at their Slee Banyan Restaurant. From right: Busarin Larpadisorn, Manus Kaewpeng and Vivien Gay enjoy the evening. The Nok Air Ambassadors led by Nok Airlines Vice President – Corporate Communication Suriyapa Bunnag (front row, 4th left), received a warm welcome from Kantary Hills, Chiang Mai General Manager Magrin Promyothi (front row, 2nd left), during their ‘Nok Air Ambassador Workshop’ at the hotel recently. Top model and make-up artist Onnapa Kritsadee, (front row 3rd left) was a guest speaker at the event.